Read more about Do you have enough PPE? 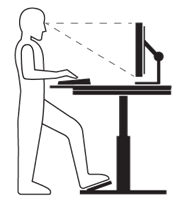 A sit-stand workstation is one that allows the user to alternate between sitting and standing by being able to lower or raise the work surface. Sitting vs. standing, which one is better? With the closure of Consolidated Laundry at the end of March, the UW is in the process of moving to a new vendor for lab coat cleaning. UW Procurement Services is assisting with the transition to an alternate laundry provider (MediCleanse) for laboratories and academic spaces on campus. Environmental Health & Safety is beginning a project to migrate online training content, course registrations, and training records to a learning management system (LMS) called Bridge. This migration is in an effort to streamline our training management processes and deliver more current and reliable on-line EH&S training content. Bridge will ultimately provide a single registration process for both on-line and instructor-led (classroom) courses and be a single source for all EH&S training records. Read more about WA state measles outbreak: Got MMR? The 2018 Occupational Safety and Health Administration (OSHA) 300A summaries of work-related injuries and illnesses are now posted on the Environmental Health and Safety (EH&S) website, along with summaries for previous years. The summaries are required to be posted from February 1, 2019 through April 30, 2019 in a location where employees can easily see them such as on a department’s safety bulletin board or in a break room.